THIS CLASS HAS ALREADY COME AND GONE! CHECK BACK NEXT SEMESTER. DESCRIPTION: This evening is reserved for a Private Team Building Cooking Class. 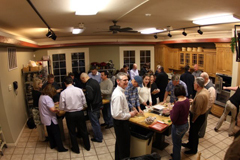 If you are interested in a private cooking class, team building class or want to host your special event at Nothing to It!, please contact Jay Bushman, General Manager or Lara Ritchie, Culinary Director via email at info@nothingtoit.com. CLASS CANCELLATION/NO SHOW POLICY: At Nothing To It!, we know that life happens. That is why we are proud to offer you the most accommodating cancellation policy of any cooking school in the country. If you cannot attend class, call us at (775) 826-2628 48 HOURS BEFORE the class and we will give you credit towards a future class for use within 60 days. If you cancel after this time or miss a class, no refunds or credit will be given but you can have the class handout which includes the recipes. If there is a waiting list for the class you cancel and we can fill your space, we will give you credit towards a future class. If you are unable to attend class, you may send someone in your place. Refunds will only be given if NTI cancels the class. We truly appreciate your patronage and look forward to serving you for years to come.